I know that there are events that make people of faith question everything they have come to believe in over their lives; traumas that make even the most pious wonder what may have happened to the god who gave them life and protected and comforted them in their most difficult times. The faith of these people is, or was, strong, and it therefore takes an event of great gravity- a house fire, cancer, the Vikings missing the playoffs- to rattle their steadfast belief. And of course, there are the self-professed former atheists- the Kirk Camerons of the world- who start off godless, but then are moved by some event, or some spirit, to reconsider. These swaying moments suggest so strongly the existence of a benevolent and involved deity that unbelief becomes, for the first time in one's life, the less-reasonable option. It often comes in the form of an intervention in what appeared to be an indifferent universe: a bus careens toward an unsuspecting pedestrian, but is somehow- or by something- rerouted and allowed to slip harmlessly by. What there seemed to be no evidence of was now undeniable, and prompts- at the very least- some fine-toothed soul-combing: In this unending, unslowing, and uncaring universe, could there possibly be something or someone looking out... for me? I found a wheel of Jasper Hill Harbison cheese for $4.99, is what I am saying. I was at the Green Hills Kroger, perusing the Murray's-curated and operated cheese section, wondering which combination of melty and affordable Jarlsberg and earthy but expensive Gruyère would strike the perfect balance in my fondue. I circumnavigated the ovular cheese counter, stopping momentarily to allow Shirley to tempt me with some cheesy dips. I eye-fucked all the delicious cheeses: the firm wedges cut from World's Strongest Man-sized wheels and the delicate rounds of La Tur. Just then something caught my eye. A white-wrapped puck of Harbison, perched atop another white-wrapped puck of Harbison- nothing unusual at all. But slapped uncaringly onto the wrapping of each was an offensive yellow violator that clearly stated the price of the cheese: $4.99. Woohoo! indeed. You don't have to tell me Great Deal! I looked around for Mitt Romney or Jimmy Kimmel or some other mean-spirited "prankster," but there was none to be found. I looked around again to see whether I was doing something wrong (it felt like I was). I wasn't. I looked closely at the label, and realized that the sell-by date was fast approaching. That was it! The ignorance of the Green Hills shoppers was my gain. Is it possible that they just happened to have left two pristine pucks of Harbison untouched for weeks, and the management at Kroger just happened to discount it by 75%, and I just happened to walk up at the right time? Yeah- maybe it was just coincidence. But some find it extremely unlikely that the human eye, with all its rods and cones and lenses, resulted from tiny incremental changes over humanity's long history. Some are stirred by other hugely auspicious events. I'm not saying that this discovery has turned a grizzled unbeliever into a credulous man, but I remind you: this cheese is normally priced at $25 per pound, and here were two 10 oz. rounds all but dropped in my lap for a Lincoln apiece. 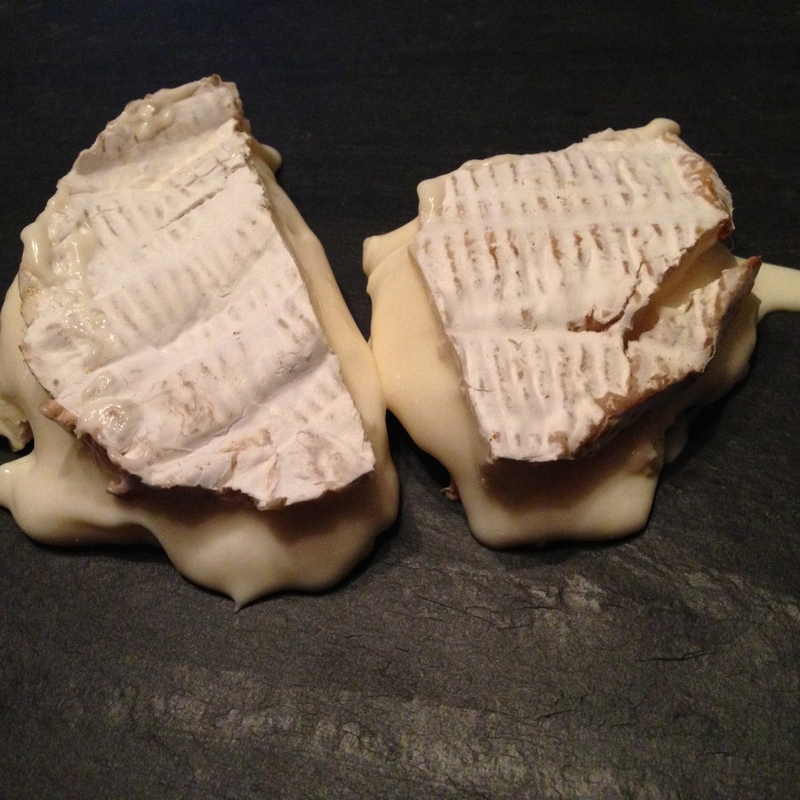 Harbison is a ripened, bloomy-rind cheese made by Jasper Hill Farm in Vermont. Their incredible products are led by, but by no means limited to, the incomparable Bayley Hazen blue cheese. That was the first Jasper Hill product I tried, maybe ten years ago, and it was one of those foods that clued me into the existence of something greater in the cheese world than pepper jack- not that that simple product does not still hit the spot at times. There's more out there, the cheeses of Jasper Hill whispered to me. One of the first things I heard about Jasper Hill was that they name all their cows. Whether that's true or not, the point stuck: this was a small operation. They have like 45 cows now. It was years after I tried Bayley Hazen that Chef Richard Neal introduced me to Harbison, which he described with the bubbling-over excitement of a teen regaling his friends with the story of his first trip to second base. It was impossible not to be touched by his enthusiasm for the cheese, and it was one of those things that I just knew I was going to love- he made me want to love it. But wanting to love can so often lead to disappointment. Not in the case of Harbison. The cheese more than lived up to the lofty expectations that I had for it the first time around, and it has never let me down. Its aroma is ripe, but its flavor is mild and delicate, and hints at the spruce bark that wraps each piece. The unbroken round of cheese is dense-feeling, but the inside is composed of a pâte so creamy and high in milkfat that it positively oozes at room temperature. In fact, Harbison, if it's not very cold and/or very young, should not be cut at all. The outside should be left intact, and the top rind should be removed- or left on- and the gooey pâte should be spooned out onto whatever conveyance you're using to get the heavenly paste to your maw. And there's nothing wrong with using the spoon itself. My heavenly streak of luck thrust Harbison into an unplanned role, and it went perfectly with crisp white wines and pilsners. But this is a cheese that can make you forget that there is more food to come. With a crusty baguette and a Belgian beer, it's the kind of simple and sublime meal that makes you wonder whether anyone, anywhere, is happier in his moment than you are in yours. Is it proof that there's a higher power that cares about your happiness? Maybe not. But Harbison is proof that sometimes what we have here, right in front of us, is more than enough. There's a good video of them making Harbison here.